THERE was nothing extraordinary about the site of a former coal mine on a piece of land in Shanksville, Pennsylvania. In fact, in the year 2000 the entirety of Shanksville’s population consisted of only 245 people, according to the US census. On the site, pre-existing buildings had been demolished and amidst an abundance of hemlock trees the once tired and overworked land attempted to heal. But on 11 September 2001, United Airlines Flight 93 – a direct flight from Newark, New Jersey to San Francisco, California – plummeted from the sky at 580 miles per hour, crashing onto where the former coal mine used to be. Flight 93 is different from the other three 9/11 flights in that the aeroplane never reached the hijackers’ intended target – thought to have been either the White House or the US Capitol. 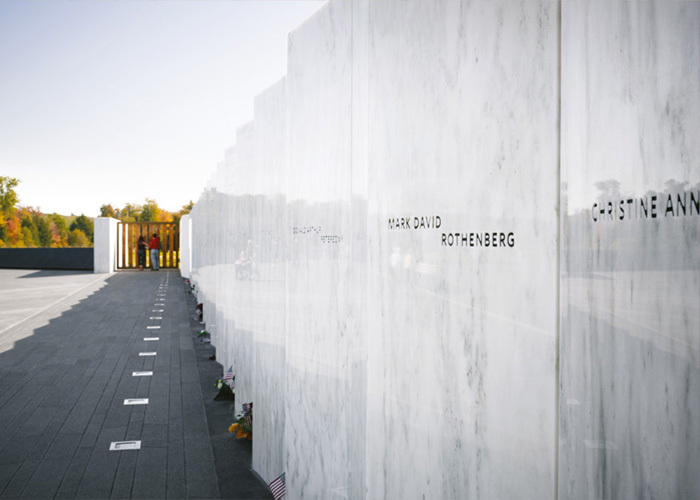 Instead, Flight 93 goes down in history as a courageous struggle and a symbol of sacrifice, as a group of the 40 passengers and flight attendants, learning of the intentions of their four hijackers, came together to crash the plane before it could collide against its destination and spared an unknowable number of lives in Washington DC, the nation’s capital. This extraordinary circumstance, a heroic and remarkably quick response to an impossible situation, makes Flight 93 certainly distinctive. 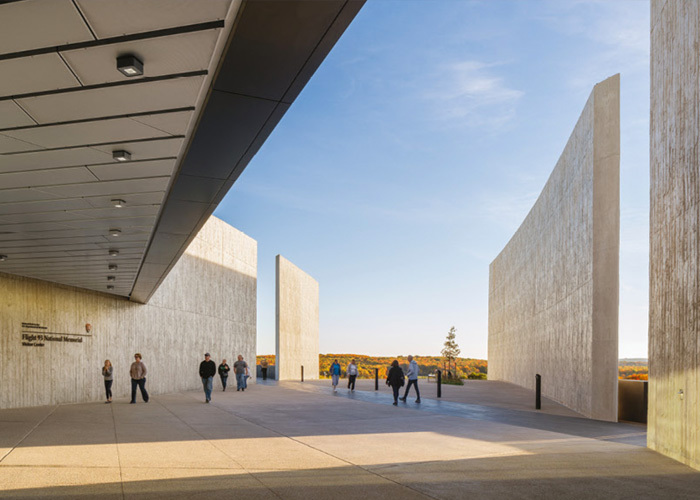 So when Congress passed the Flight 93 Memorial Act in 2002, it’s unsurprising that 1,100 designers submitted proposals to its international design competition in the hope that their entry would be chosen as the winning memorial dedicated to the catastrophic event. 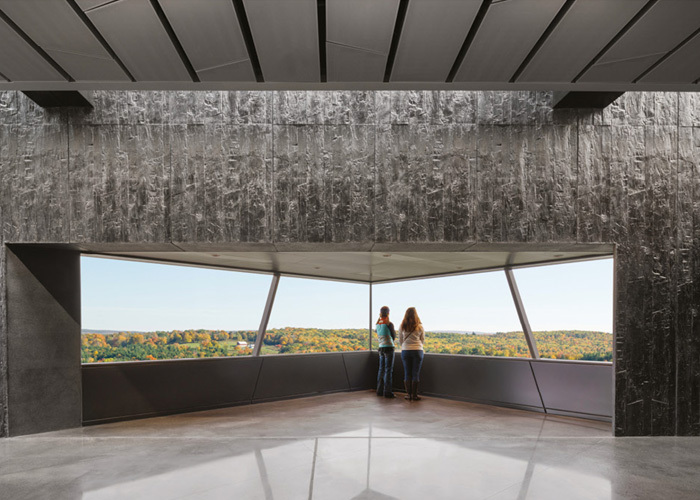 For them, the story of sacrifice would instead be narrated by the solemnity and immensity of the landscape itself, all the while being enhanced by design elements that take visitors through a pilgrimage of the site. Sacrifice, like nature, is both fragile and powerful, so to discuss how it can be translated through architecture and design, we spoke with Paul Murdoch about his team’s design decisions in representing and honouring sacrifice, how emptiness can be bursting with meaning and how one memorial can echo the voices of 40 passengers who, instead of becoming victims, died heroes. Visitor Center entrance along the flight path. Image by Eric Staudenmaier. One thing that’s unique about Flight 93 is that it crashed into a field before the hijackers could make it to the capital. In a way, the field itself is inherently representative of the actions of the plane’s passengers. What qualities of the field were vital for you to preserve in the design? As the mission statement for the memorial states, it was “a common field one day, a field of honour forever”. We really wanted to work with this idea of a ‘Field of Honour’, which is ultimately what we call the crash site in the design. That was the setting that we wanted to work with. From the initial stages of the design process, we were aware that the crash site was at the edge of this very large field, which for decades had been used for coal mining. At its backdrop we could see a grove of hemlock trees, as a slope descended down to the crash site. The field is roughly circular in shape, and we understood these characteristics of the field should be recognised and preserved. 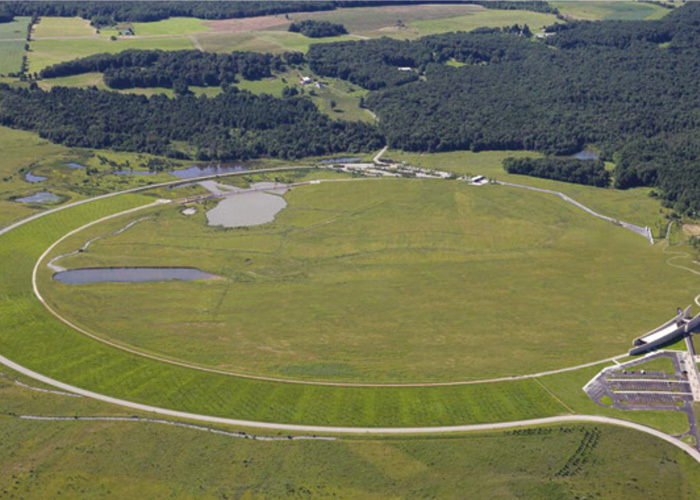 The other thing is that the sheer scale of the open landscape is important: the park is 2,200 acres of land, nearly three times the size of Central Park in Manhattan. We recognised right away that because of the size of the site, if we designed and built an architectural monument it would be too easily dwarfed in the scale of the landscape, so we decided to work with the land to really create a memorial landscape. We wanted to recognise the passengers’ heroic actions through a spatial statement: through recognising and respecting the scale of the land, the memorial is embedded with a heroic quality in a unique way. Symbolically, these gestures working with scale, form, landscape and the movement of visitors through the memorial create this whole expression and experience. Can you tell me about the symbols you used in the memorial and how these elements help tell a story? For us, the plane’s flight path very much defined the event. The plane sort of cut through and over the field before it crashed at the edge of it. Recognising that trajectory, the direction that the plane came through into the site, was also important to us in the design. We chose to formally define the edge of the field in this circular way with trees, and through this, we make a gesture to embrace this place, the space of this field and the 40 people who were lost that day. Near the entrance to the park, we’ve designed a tower to stand 90 feet tall. Inside, and once this feature is built, it will hold 40 wind chimes. 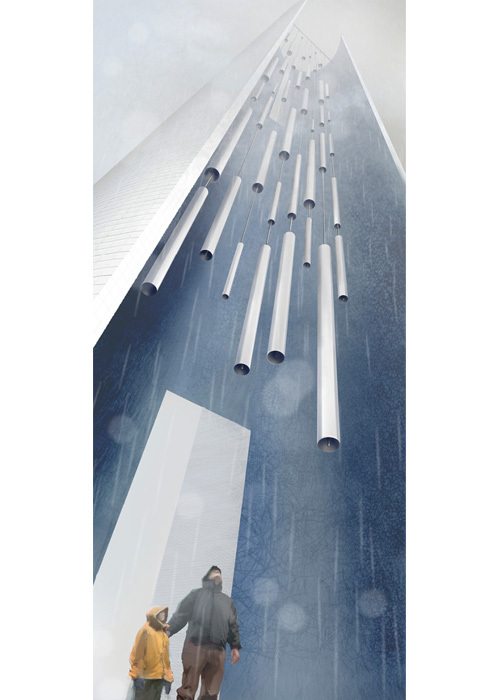 The idea behind this is that the memorial will have this vertical, monumental structure as a kind of landmark seen from the nearby highway, marking the entrance. Symbolically, those 40 wind chimes are a living memory representing the sound of the voices of those 40 people, many of whose last conversations where on phones with loved ones while on the plane. It’s a heroic statement, a very personal and intimate entrance to the park. Do you think the memorial will help visitors connect to these 40 passengers, and do you think it might inspire them to become courageous in small acts in everyday life? We hope so. This is about visitors participating in the memorial through contemplation and through movement along the landscape’s different places. After bringing people in through the flightpath, we then have them arrive at an overlook of the crash site. There is about a mile-long walkway before reaching the memorial plaza at the end of the crash site; the idea is to give visitors time in the Visitor Center to contemplate what they have just taken in, so by the time they arrive at the crash site they’re in a different frame of mind than when they came into the park. Subsequently, we don’t have them walk down the hill directly to the crash site, but instead have them move through the different spaces around it, so that they can have various vantage points and so they can experience the many qualities of the landscape. One of the particularities of this project is that it’s commemorating something that happened fairly recently which will for ever go down in history. Would you say that a memorial isn’t solely about remembrance, but also about healing? Yes, very much so. It is definitely about both things. However, I think that the proportion of those two does change over time. There’s an immediate need for healing now for those who have lost loved ones, and for all those who experience 9/11 in their lives directly. Over time, and we even see it now, there are school kids who visit the memorial who weren’t alive in 9/11. It’s about remembrance so that future generations understand what happened here. Remembrance is key, but we very much approached the project as a healing place – the healing of the site, from being a former industrial coal mine, is very much expressive of the healing power we hope the memorial with have for people as well. The perimeter of the crash site, defined by a ring of hemlock trees, is interrupted and open. It’s not a complete circle. What does the openness of the ring represent for you? For us, it represents an open-ended future and an open experience for visitors. We’re not trying to overly programme or define the experience of the memorial for anybody. We want it open to each person’s interpretation, and we want them to experience it on their own terms. The interruption of the circle is a way for us to acknowledge that people are going to be coming and bringing their own life experience to it and these interpretations, projected onto the circle, are what complete it. Keeping it open-ended allows the memorial, and the story, to continue living. I know that you took the passengers’ families into consideration during the design process. How do you consolidate a memorial which is culturally meant for the American people at large, but one that’s also very personal and deeply connected to the living families and friends of these 40 individuals? It’s impossible to work on something like this and not think about the families and how they’re feeling. That was one of the difficult things about it. We wanted this to be personal to them, but at the same time we kind of have to suspend the emotional weight of this to an extent; we have to do this with a certain perspective and distance so that the memorial can endure. It has to be personal not just for the families but for all visitors; it must remain accessible to people and it has to remain relevant going forward in time. The families very much understood that, as part of what we had to do here. To them it’s a very special place – the final resting place for their loved ones. It’s their cemetery, it’s sacred. There are certain experiences for the families that can only be for the families. But they also realise how important this place is for America and its history. We’re fortunate that the families understood the line between the personal and the historic. Wall of Names along the flight path. Have you been moved by any particular story that a family member has shared with you throughout this process? We took what was there and made it a more amplified experience. And that place, being charged with emotion and symbolism, is in itself a kind of affirmation: that because it’s open, it doesn’t mean it’s empty and has nothing there. View window overlooking the Field of Honour and crash site. Why do you think that the creation of memorial spaces is important? What can space and architecture convey that we can’t get from reading the story in a book? There’s a Visitor Center at the site now and it’s the place where you find the narrative, images, text, video and audio – it’s powerful. When you read, listen and look at the history that occurred here, it’s emotional. But there is no substitute for the direct experience of the place itself. Each place has its own qualities, a spirit. It has to be felt by experiencing it directly. Writers and artists can interpret that and reveal that for people, but I just don’t think that there’s a substitute for being in the place itself. Recently, I was talking in Washington about the memorial and somebody said, “This is one of the most heroic acts in American history. Why isn’t the memorial heroic?” I just looked at him and said, “Don’t you think the size of the landscape is heroic in itself?” He hadn’t been there, and until you visit and experience the space, you can’t really understand it, not fully. 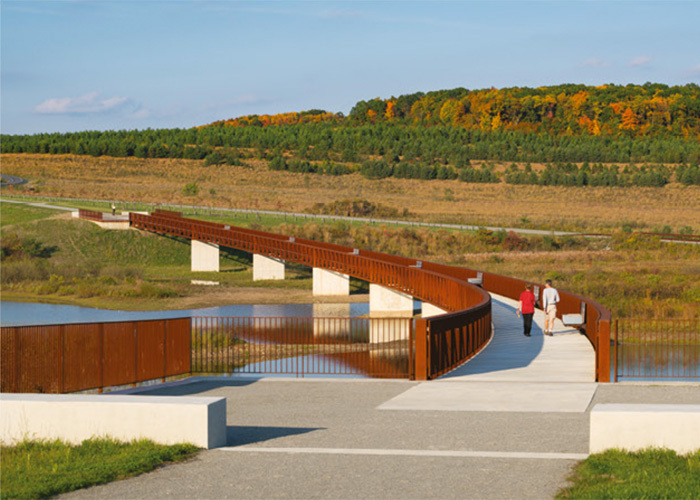 Pedestrian bridge over restored wetlands. What does the word “heroic” mean for you? There’s a certain reverence and awe that comes with it. What we tried to express in the memorial has to do with overcoming and facing an enormous challenge despite fear, despite loss. That’s what we recognise as heroism. As you know, it has to do with sacrifice, it’s understanding that you are making a sacrifice. And of course you have to try and understand what sacrifice is – it’s an action that inherently is a form of generosity. Sacrifice is a type of offering that acknowledges that there’s something or someone beyond yourself. And I think that makes sacrifice both tragic and beautiful.